In February, student newspaper Minnesota Daily reported that UMN will incorporate a state-of-the-art stormwater reuse system into its latest construction project. The system, expected to be operational by December 2019, will recycle stormwater from rooftops to feed air conditioning units. This capture will save water and capital that would otherwise be spent purchasing water from the city. Both in classrooms and around campus, Minneapolis offers UMN students a host of other ways to engage with the latest in stormwater. UMN is in the process of renovating a residence hall and constructing a new Health Sciences Education Center next door. A joint stormwater reuse system for the two buildings will collect stormwater from rooftops during rainstorms, filter and chill the runoff, and eventually evaporate it to supply air conditioning during warmer months. 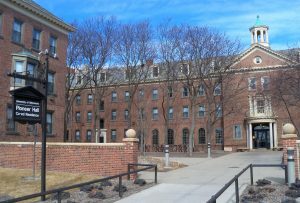 The University of Minnesota (UMN; Minneapolis) is renovating Pioneer Hall, a dormitory building first constructed in 1930, while also constructing a Health Sciences Education Center next door. The two buildings will share a new stormwater capture and reuse system, capable of storing up to 13.2 million L (3.5 million gal) of precipitation for reuse in air conditioning units. Jon Platek/Creative Commons. UMN engineers expect the system to retain up to 13.2 million L (3.5 million gal) of stormwater, according to Minnesota Daily. Incorporating stormwater management into on-campus construction projects has become standard practice since 2013, when the university built a new residence hall equipped with a system that repurposes stormwater to flush toilets. In 2018, UMN constructed a 31,400-m2 (338,000-ft2) complex to house the university’s athletic programs. Beneath the complex’s football practice field sits a 1.3 million-L (350,000-gal) stormwater storage tank, which recirculates water into nearby air conditioning units. During the system’s first summer of use, UMN’s head mechanical engineer Scott McCord said it was able to supply most of the roughly 5.6 million L (1.5 million gal) of water required to cool the complex’s buildings. McCord added that developing systems that treat and reuse stormwater from more than one building provides greater gains for the environment without disproportionately affecting the university’s bottom line. Directly adjacent to UMN’s Minneapolis campus sits the Towerside Innovation District, a 150-ha (370-ac) development project that serves as a testing ground for experimental approaches to city planning. One such experiment is the Towerside District Stormwater System (TDSS), which demonstrates how residents can save money by managing stormwater discharges at the neighborhood scale rather than individually. Before any Towerside tenants constructed new buildings, in 2015, the Mississippi Watershed Management Organization (MWMO; Minneapolis, Minn.) worked with each development’s architects to create a common stormwater capture system that would treat runoff from a 3-ha (7-ac) area. 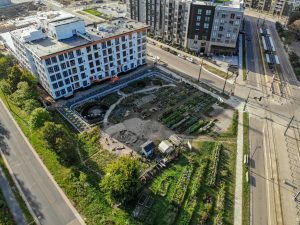 Directly adjacent to the UMN campus, the Towerside District Stormwater System represents a new approach to stormwater management. By chipping in for a jointly owned stormwater capture and reuse system, a growing collection of neighboring landowners saves on capital costs, improves building values, and enables building-scale stormwater reuse. Mississippi Watershed Management Organization. TDSS consists of two massive biofiltration basins sized to handle a 10-year rain event, a 782,000-L (206,500-gal) storage tank underground, and approximately 460 m (1509 ft) of storm sewer pipe that tie the developments together. All told, MWMO expects the system to treat about 90% of all runoff produced within its service area, remove 90% of total suspended solids and 60% of total phosphorus. This level of treatment surpasses local stormwater management requirements. The system also features stormwater reuse capabilities, enabling property owners to recirculate runoff back into their facilities to experiment with building-scale reuse. TDSS came online with the completion of the first development in 2017. Two additional properties are expected to connect to the system this year, with a fourth parcel slated for 2020. Property owners saved about 15% on capital costs by chipping in for a communal system compared to what they would have spent on individual systems that meet the same treatment goals, said Dan Kalmon, MWMO’s principal planner for the project. Read more about the TDSS project beginning on page 12 of the Spring 2019 issue of World Water: Stormwater Management magazine. While stormwater projects at UMN and throughout Minneapolis inspire interest in new ways to protect water quality and improve environmental resilience, stormwater-focused university courses offer ways to turn interest into action. Since 2002, UMN has held its Erosion and Stormwater Management Certification Program, offering advanced courses and official credentialing and recertification exams for Minnesota stormwater professionals working in industrial and construction settings. Each course is taught according to Minnesota National Pollutant Discharge Elimination System (NPDES) permit requirements and offers numerous 0.5- to 2-day programs throughout the state.